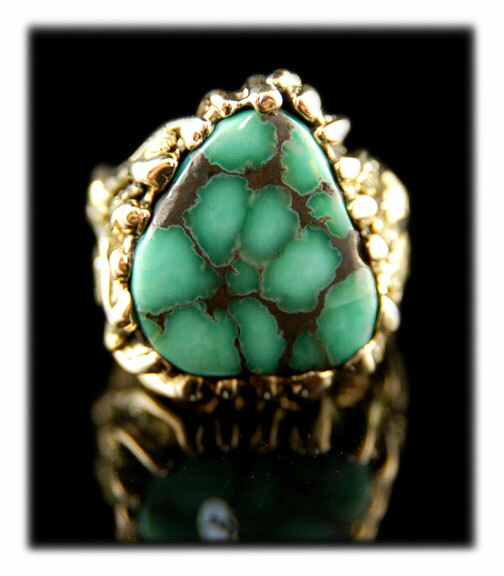 One of our long time favorite varieties of American Turquoise has always been Damele also spelled Damale or Damaile. We love all the gems from the famous Nevada mine, the Turquoise, the Variscite and the Faustite. The Damele mine outside of Austin, Nevada produces some of the most wonderful Turquoise and Variscite in the world. 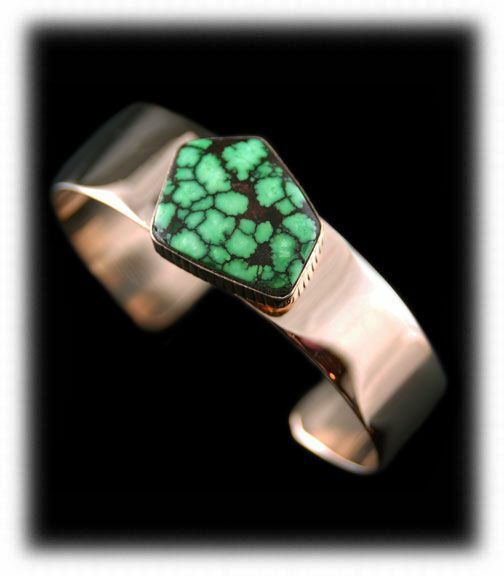 A great majority of the Damele Turquoise and Variscite features spiderweb matrix. The Damele mine is known as a spiderweb Turquoise mine and is known for its lime green Turquoise, Faustite, and Variscite. The mine was first made famous for it's yellow to lime Turquoise with black and brown spiderweb matrix. Very little Turquoise is being produced today, and what little material is being produced is mostly the beautiful deep green to lime green Variscite. Much of the Damele Spiderweb Turquoise sold presently is cut from older rough that can still be found from various Turquoise dealers, collectors and the mine's current owner Tony Cotner (written 2014). Damele is very hard and comes in a variety of colors from yellow, gold, greens and grays with a beautiful spider webbing. 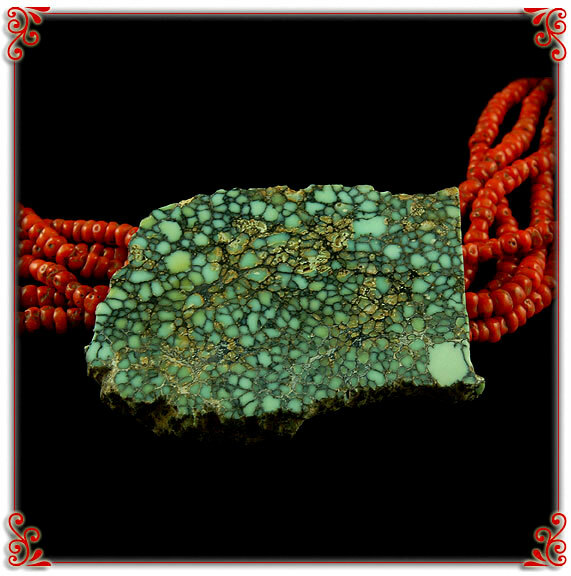 It is a well known mine with highly sought after spiderweb Variscite and spiderweb Turquoise cabochons and beads. Above is some natural rough from the mine outside of Austin, Nevada that will be used to cut Damele Spiderweb Turquoise Cabochons. You can see the amazing mint to lime green color with almost perfect spiderweb matrix. This rough Damele Turquoise is 100% natural and is a great example of high grade natural Damele Turquoise from Nevada, USA. As you can see from the natural gemstone cabochons above, Damele Turquoise, once cut, produces many different looks. Damele Spiderweb Turquoise is of coarse the most valuable and famous of the looks. In the picture above you can see many different looks and colors of Spiderweb Damele Turquoise. The cabochons above are high grade natural Damele Spiderweb Turquoise. We did not show all colors or looks of natural Damale. Above to the left is handmade 14k Gold bracelet with a top gem grade, natural, lime green, Damele Spiderweb Turquoise Cabochon from Nevada. 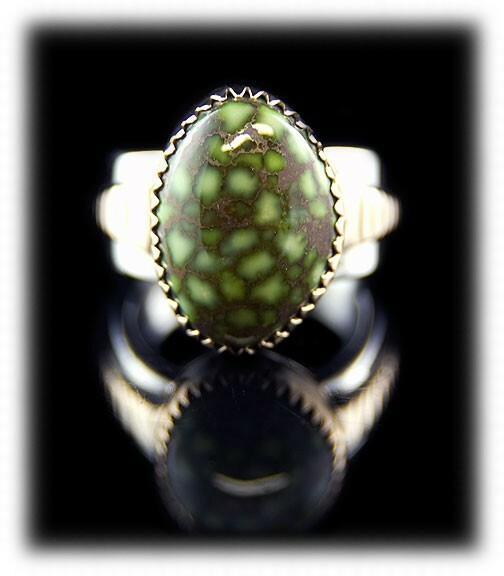 Above to the right is a "Lost Wax" style 14k gold ring by John Hartman with top gem grade natural Damele Variscite from Nevada. You can see how close these stones look to each other. I can usually tell the difference between Damele Turquoise and Variscite by the translucency and glassy appearance. The Variscite will usually look more glassy and is harder than the Damele Turquoise. You can see from these rings why lime Turquoise is so desirable these days. 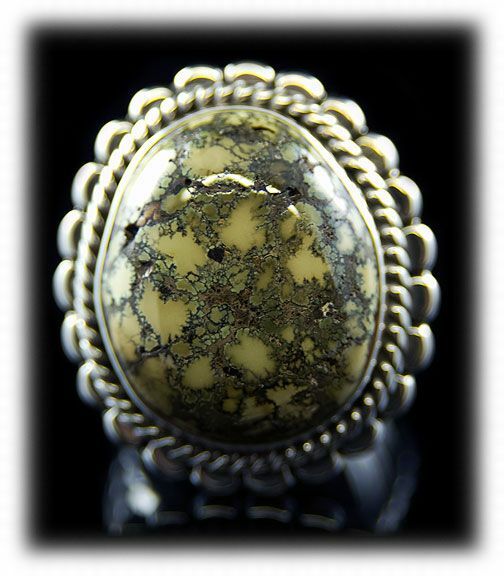 Above to the left is a handmade Sterling Silver ring with natural spiderweb yellow Turquoise with black matrix from the Damele mine by John Hartman. 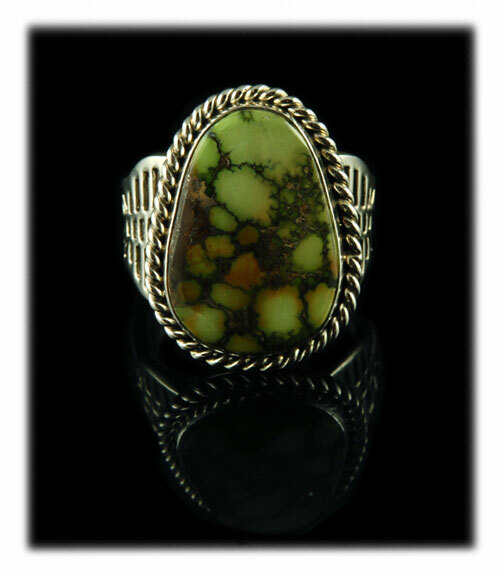 Above to the right is a handmade Sterling Silver ring for men with top gem grade lime to yellow spiderweb cabochon from the Damele or Damale Turquoise mine. Both gemstones have gorgeous natural black spiderweb matrix. 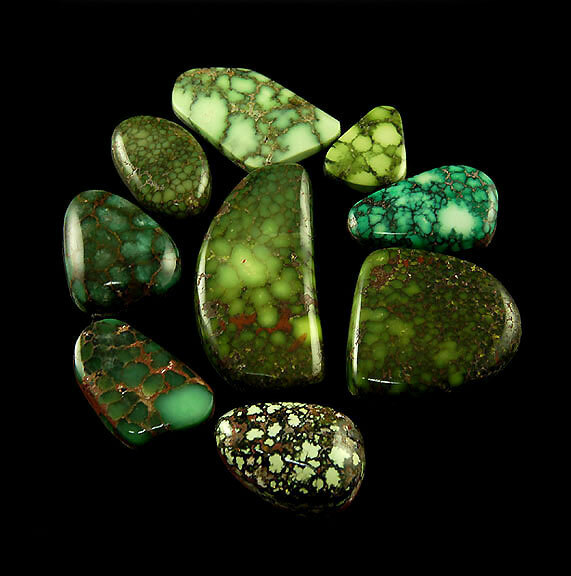 You can really see the variety of colors and matrix patterns in the stones above and the images of Damele Spiderweb Turquoise cabochons and rough on the page. Benny Damele discovered the Damele mine about around 1973. This mine is located outside of Austin Nevada in the Dry Creek Ranch owned by the Damele family, they raise unique horses there that carry the Damele name. This is where the name of this mine comes from. There are a couple other well known mines close to this mine, the Dry Creek mine and the Godber mine. This mine is on the flats just as you are getting into the foothills of a mountain range, one of the more pretty locations for a mine. Just starting to get to an elevation that has the smaller pine trees like juniper and pinion a very scenic location. The mine that I had was on top of a mountain that looked down on this mine. Mining did not start at the Damele or Damale mine until Clyde Wright acquired the mine. Wright operated the mine for almost 18 years. Wright sold the mine to Tony Cotner. Tony Cotner. Tony has brought this Nevada Turquoise mine most of it's fame. Thank you for reading about Damele Turquoise.